It's back to school tomorrow and, apart from The Boy who only has to move one classroom along to Yr 2 *yawn* it's new schools and new ways of learning for all of the girls. Sixth Form or College or whatever they choose to call it has different rules to school (*whispers* even though it is the same actual school they were at). You're ALLOWED to wear jewellery and make up, if not absolutely, actively encouraged to do so (this IS according to TeenTwin2). TeenTwin1 is studying art and psychology, TeenTwin2 drama and textiles and both of them are studying English literature because that IS the law *looks around shiftily while holding entirely fictitious rule book behind back* and I'm annoyingly, embarrassingly, excited for them. I LOVED sixth form, I LOVED the freedom it gave after the constraints of GCSEs though, in my day *cough,* we called them O levels. And The Third Girl. My baby girl. The child that only turned 11 less than TWO WEEKS AGO, tomorrow she starts secondary school. The same secondary school the TeenTwins have just broken out of so we have, as a family, been there and, quite comprehensively, done that. Not that it makes it any easier the second time around and, in some ways, it's harder because the first time I sent twins and this time not. Though she is practically welded to her BFFs Forever and well, to be honest, they seem to get on much better with each other than the twins ever did. She's excited too, beyond excited. Bursting with anticipation. She has *looks at time* JUST settled into bed after springing out of it every three minutes for the past three hours with yet ANOTHER question, hypothesis, query, wibble and worry but she's bouncing, glowing. She CAN NOT wait, but then she never could. I, on the other hand, know tomorrow morning I will panic about the time. I will worry. I may even shout a bit. I WILL try to make her eat porridge when really she's entirely happy with a bagel and a cup of tea. 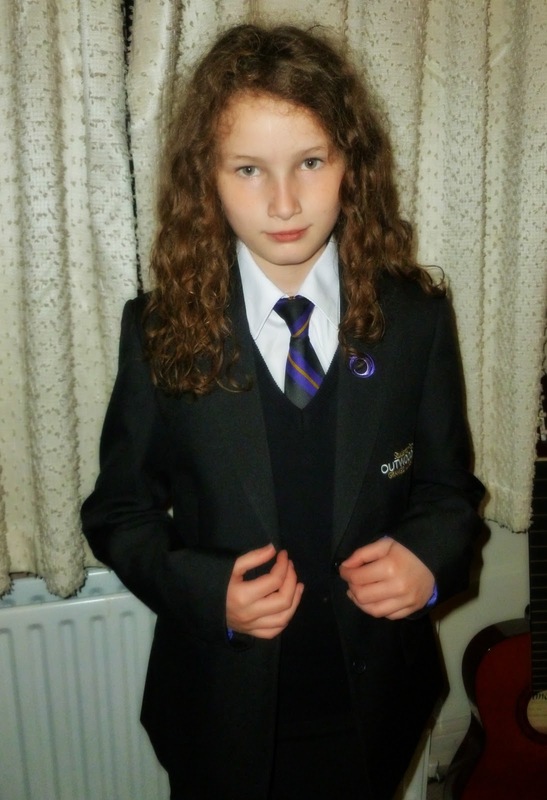 I will check she has her lunch money about five times, and tuck her shirt in three times and I'll faff with her hair until she goes "Ohhh Mum" and stomps off to sort it out herself. And then, when she leaves the house, I'll have a bit of a cry.